BSA’s waiver of rear yard regulations needed to allow development of 79,498 square-foot supermarket on West 155th Street. 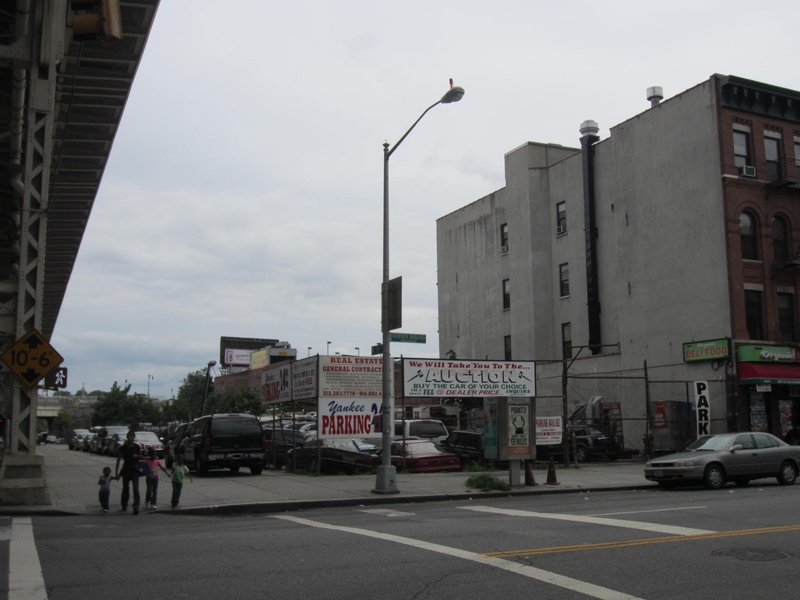 Cactus of Harlem LLC applied to the Board of Standards & Appeals for a special permit to develop a 79,428-square-foot Western Beef supermarket at 280 West 155th Street in Harlem. The project site is at the corner of West 155th Street and Frederick Douglas Boulevard, and comprises three lots currently used for parking. Cactus of Harlem’s proposal called for a three-story building with supermarket uses on the ground and second floors, and commercial uses on the third floor. The project would include 79 underground parking spaces. The lot is zoned C8-3, and an R7-2 district abuts the site’s southern lot line. Cactus of Harlem needed BSA’s approval to waive the zoning resolution’s rear-yard requirements because the building’s ground floor would extend to the rear lot line and encroach within the 30-foot open area required in commercially zoned lots abutting residentially zoned districts. BSA in 2000 had granted Cactus of Harlem a special permit to develop a smaller supermarket on the site, but the special permit lapsed and Cactus of Harlem acquired two neighboring lots in which to develop the project. Manhattan Community Board 10 opposed the proposal. CB 10 was concerned the project would lead to an increase in traffic and argued the supermarket was unnecessary because there were three other supermarkets within a ten-block radius of the site. Further, CB 10 found that a public service use on the lot, such as a library or after-school center, would better serve the community. Local Council Member Inez Dickens opposed the proposal, citing CB 10’s concerns. BSA granted the special permit, finding that the waiver would not adversely affect the surrounding area. Noting CB 10’s traffic concerns, BSA pointed out that the project’s environmental assessment indicated that a supermarket would have no impact on traffic. As to whether a public service use would better serve the surrounding community, BSA noted that a supermarket use was an as-of-right use under the site’s C8-3 zoning. Finding that the proposal would have a minimal impact on surrounding parcels, BSA noted that the existing street-grade change from West 155th Street would reduce the effective height of the encroaching ground floor when viewed from the adjoining lots to the rear. BSA: 280 West 155th Street, Manhattan (31-12-BZ) (Feb. 8, 2012) (Sheldon Lobel, P.C., for Cactus of Harlem).